Decks are a commonly used outdoor living space. These hand rail mounted bamboo planters will surely enhance your deck or patio with its natural, vibrant cedar wood color, and simple design. 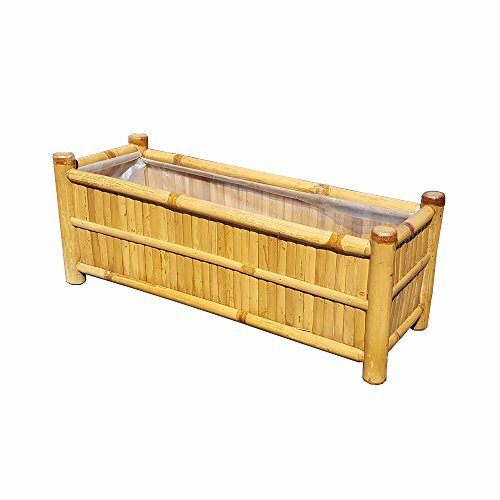 Our bamboo deck planters can rest on top standard sized 1" x 6" deck rails and be secured with screws. It can also serve as a space saver. You may secure the planter onto the hand rail top using the wood screws. We used crack resistant Calcutta bamboo for strength and longevity of the planter. Plastic liner is stapled inside to prevent rot. Deck planters are finished with wood outdoor sealer which gives you the most stable natural outdoor protection you can get. Fully assembled, no assembly is required. Mr. Garden Balcony Railings Flower Pot, Fence Planter , Office Partition Flowerpot, Ride flowerpot Green D 11" x H 9.8"